Seeing a baby grow up and act more adult-like can be a bittersweet moment for a parent and it is especially evident in their sleeping arrangements. There will come a time when the baby reaches an age when they have to transition from a basket or a bassinet to a crib to a toddler bed, which can be a very exciting moment for everyone. However, the biggest concern parents have about getting them to sleep independently in their big girl/boy beds is the risk of falling off their beds. We all know how toddlers can be very restless – and that is true even when they are asleep. These little creatures tend to move around a lot so the risk of falling is always huge. A fall might sound like a very small matter and something that parents should not be worried about but this could be the opposite. The thing is that falling off a bed can be dangerous and can even result to a very serious injury. Plus, would it not be better if you can actually sleep through the night and not have your lovely dream cut off by the sound of a wailing child? When it comes to swinging down bed rails, Regalo is clearly the king and for good reason. This one comes in a really good size that is perfect even for a toddler who moves around in bed a lot but there are also many other things that we, here at Parents Need HQ, like about the product. One of the biggest worries parents have about using bed rails is the height. Fortunately, this one comes with a pretty good height and can be used even with deep mattresses. Another thing that we really like about this product is the Gap Guard. Basically, what this means is that it was designed to hug the mattress of the bed so there is no gap between it and the mattress where your toddler could possibly slide down. We know it sounds very basic in a bed rail but there are simply those that are designed very poorly and do not consider this design flaw. Swing gates from Regalo are all JPM certified so you can ensure that you are using only the safest products in town. It is also a huge plus that their bed rails are designed with easy assembly in mind. Did you know that you can install these on beds without having to use any tools? Nope, you do not need to have hammers and screws on hand at all. Cool, right? Now, most parents are really scared of using anything white around toddlers; we all know how messy and dirty these kids can be. Thankfully, the material used for the rails are very easy to clean and wipe off. You can also take off the mesh material from the frame and toss it into the washer (if you are brave enough to do it, that is). It does take some time to get used to having this on the bed and you will have to learn how to swing it down properly so you, the parent, can get in and out of bed without any problem. Sure, you can also teach your toddler to do it but they might play around it too much and forget to put it back up when they go to sleep. For something that comes with a good enough quality, it is definitely a whole lot cheaper than the others in our list which is why we have placed this at the top spot. If you are looking for a bed rail that comes in pairs then you should consider getting this one from Summer Infant. As its name suggests, it is a double rail so you get protection on both sides of the bed, perfect if your toddler's bed is not positioned near the wall. What we really love about this product is its sturdiness. Just judging by its weight, you can already tell that it is made of very strong and very sturdy material that will not easily break or go down in case your kiddo sleeps against it; it will surely hold their weight and ensure that they will not fall from the bed. Both rails also connect under the mattress so you can be sure that it does not fall off easily because of your child’s weight. Additionally, because of its design, it means that you do not have to have tools like hammers and screws to have it installed on the bed. Simply mount it underneath the mattress and then you are good to go. This Summer Infant bed rail is perfect not just for when you have kids who are transitioning into their full sized beds but also for when you are co-sleeping. One side of the rails is designed to easily fold down for easy access so you can change the linens or sit or even lie down beside your toddler without any hassle. The biggest drawback that we have seen so far, apart from the price (although this is understandable as it does come with two rails instead of one), is the lack of clear instructions. If you are not very handy, it might take a while to figure out the instructions especially if your bed is not quite the same as what is used in the manual. It will probably take you some trial and error before you get things sorted out. Still, after weighing all its pros and cons, we think that this is a great product that should still be considered. As such, we will have this placed at the second spot in our list. For those who have a not-so-little kid who uses a toddler bed to sleep in at night, then consider getting the DexBaby Safe Sleeper bed rail for them. 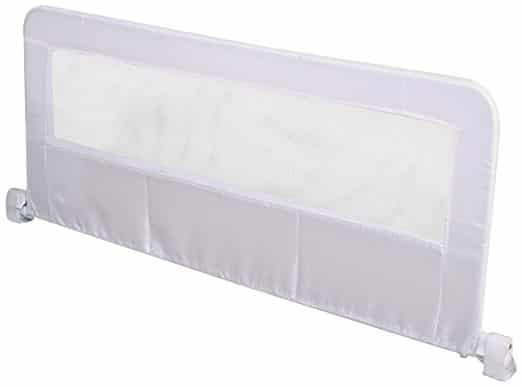 It is specially made for use on toddler sized mattresses and provides moms and dads the peace of mind that they are looking for knowing that their kiddo will not fall off from their beds in the middle of the night. One of the most important things that we like about this product is that it truly keeps safety to mind first. In fact, we believe that this one is among the sturdiest bed rails in the market and there are two basic ways to install it and ensure that it stays on even with all the toddler weight that it has to put up with. For one, you can snap it on the spring platform that holds the mattress and it stays there strong and tight. Doing this already ensures that the railing will not shift or buckle. Another way to install it is to install a wooden bracket on the platform where the mattress sits on by drilling. The second option will definitely take more time and skills but it will be well worth the effort. Now, just because the railing is well reinforced does not mean that there is no way for parents to lie beside their children anymore for a quick bedtime story. In fact, it does come with a two-way release so that you can quickly lower it and enjoy some moments together without the railing getting in the way. Parents also love the fact that this railing makes use of super high-quality materials. Sure you have a great design but when you use sub par materials, what good is it to you? The plastic and metal parts of this railing are made from strong and sturdy materials so you can use it for each of your children for years. The nylon and mesh are also made from durable material and does not easily wear and tear no matter how active your toddler can be during their sleep. Perhaps the only biggest complaint we have for this one is the installation process which can be a bit difficult. Still, we think that this should be placed at the third spot in our list. Most bed rails available in the market feel very cage like and are not exactly the most appealing for toddlers and even for their parents. If you want a better alternative to these metal rails, then consider getting these bed bumpers. It is basically like two bolster pillows placed on each side of the bed but it can already ensure that your toddler stays safe and tucked in their beds the entire night. What do we, here at Parents Need HQ, love about this product? There are many things. For one, we love that it makes use of high-quality non-toxic foams that are covered in water resistant covers. If you have a kiddo who still wets the bed at night, at least you can be reassured that you do not have to wash and change the bumpers every single day since it stays protected. Many parents are quite hesitant about using this product (we know we were, too) because it does not seem to provide that much protection especially when you have a very active toddler in bed. However, it is actually designed with just the right height – the bumpers are made steeper so children do not roll out of their beds. Despite the height, they have made it much easier for parents to stay beside their kids while they read them their bedtime stories as this one allows moms and dads to sit on the guard rail while they go through their bedtime routines. Perhaps the only major issue you will run into when using these alternative bed rails is getting the sheets to fit properly. You will have to either make use of a thinner mattress or use sheets that have deeper pockets to make sure that they fit tightly. The product also says that it comes with a non-skid bottom but they seem to have the tendency to go further towards the edge of the bed. It still works perfectly though and we believe that this one is worth checking out. As such, we are placing this product at the fourth spot in our list. This crib rail is perfect for parents who are looking for a lightweight alternative to the regular crib rails available in the market. It is made from mesh and other very lightweight materials and is very to install on most convertible cribs. It should be noted though that this crib rail is not advised for use on a toddler bed for safety reasons. This is mainly because of the gap created between the rail and the mattress where a toddler can dangerously roll towards. They work well with convertible beds though. To do this, you will just have to use its straps and attach it to the box springs below the mattress then you are basically good to go. However, if your toddler uses a rather light mattress, you might want to reinforce your setup a little by tying the strap to the opposite frame of the bed. Doing this will ensure that the crib rail will never move nor budge no matter how much toddler weight it is being subjected to. We did have some hesitations when it came to the lightweight design of the crib rail. The mesh looked quite thin which felt worrisome as it might not be able to hold a toddler’s weight. On the other hand, parents had something to be happy about because this meant that things would be much easier to clean since it is not made from heavy fabric. You can simply use a damp cloth to wipe off any stains and messes and it is already great for use again. Still, we think that there are much better products that this bed rail from Dream on Me. It does come with a rather affordable price tag but if you have a bit more money to spare and would rather go for something that looks more sturdy and reliable, we suggest that you check out other brands, especially those included in this list. After weighing all the pros and cons of this product, we believe that this one deserves to be placed at the bottom spot. Not highly recommended but still worth considering if you are shopping around for bed rails for your toddler. It might seem like bed rails for toddlers are an unnecessary accessory to add to your child’s room but if you have a very active toddler who cannot seem to remain still even as they sleep, this is something that you will definitely need. Falling off the bed can be dangerous and, if your child has fallen off once, that is most likely to happen again. Parents will want to make sure that their kiddos are kept safe even as they are sleeping and one of the ways to do that is to have a bed rail installed. If your kid still cannot sleep through the night, you might want to read through our comprehensive guide on the best essential gears for sleeping.